NASA and NOAA satellites have provided data on Maria as it strengthened into a major Hurricane headed toward the Leeward Islands. NASA's Aqua satellite provided an infrared look at Maria that showed cooling cloud top temperatures and NOAA's GOES satellite provided an animation of imagery that showed the storm developing and strengthening. The GPM satellite found "Hot" towering clouds that indicated strengthening was occurring before Maria became a major hurricane. The National Hurricane Center (NHC) issued a Hurricane Warning for Guadeloupe, Dominica, St. Kitts, Nevis, and Montserrat, Martinique, St. Lucia, U.S. Virgin Islands and the British Virgin Islands. A Tropical Storm Warning is in effect for Antigua and Barbuda, Saba and St. Eustatius, St. Maarten and Anguilla. A Hurricane Watch is in effect for Puerto Rico, Vieques, and Culebra, Saba and St. Eustatius, St. Maarten, St. Martin and St. Barthelemy, and Anguilla. A Tropical Storm Watch is in effect for Barbados, St. Vincent and the Grenadines. On Saturday, Sept. 16 the National Hurricane Center was watching Potential Tropical Cyclone Fifteen. The depression formed at 2 p.m. EDT that day. Three hours later it strengthened into a tropical storm and was named "Maria." At 5 p.m. EDT on Sunday, Sept. 17, Maria strengthened into a hurricane and continued to strengthen. The Global Precipitation Measurement mission (GPM) core observatory satellite had an excellent view of hurricane Maria when it passed almost directly above the hurricane on Sept. 17, 2017 at 1001 p.m. AST/EDT (Sept. 18 0201 UTC). GPM's Microwave Imager (GMI) and Dual-Frequency Precipitation Radar (DPR) showed that Maria had well defined bands of precipitation rotating around the eye of the tropical cyclone. GPM's radar (DPR Ku band) found rain falling at a rate of over 6.44 inches (163.7 mm) per hour in one of these extremely powerful storms northeast of Maria's eye. NASA obtained a look at Maria's precipitation structure using data from GPM's Radar (DPR Ku band). Intense thunderstorms were found towering to above 9.7 miles (15.7 km). This kind of chimney cloud, also called a "hot tower" (as it releases a huge quantity of latent heat by condensation). These tall thunderstorms in the eye wall are often a sign that a tropical cyclone is becoming more powerful. 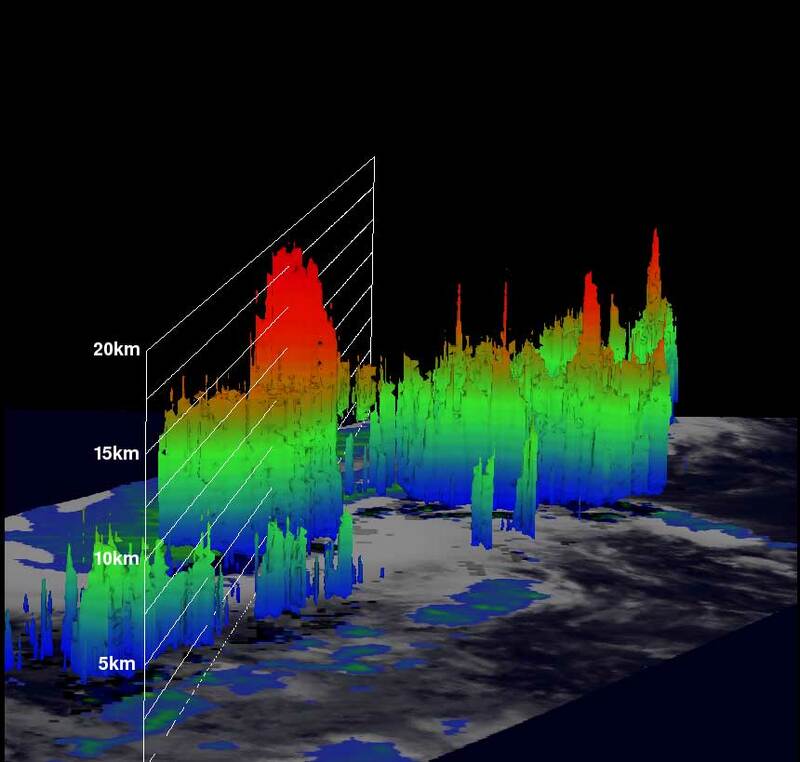 The Atmospheric Infrared Sounder or AIRS instrument aboard NASA's Aqua satellite analyzed Hurricane Maria in infrared light. Infrared light provides scientists with temperature data and that's important when trying to understand how strong storms can be. The higher the cloud tops, the colder and the stronger they are. So infrared light as that gathered by the AIRS instrument can identify the strongest sides of a tropical cyclone. When NASA's Aqua satellite flew over Maria on Sept. 18 at 1:35 a.m. EDT (0535 UTC) AIRS detected that cloud top temperatures had cooled indicating they were higher into the atmosphere. Cloud top temperatures were as cold as minus 81.6 degrees Fahrenheit (minus 63.1 degrees Celsius). Storms with cloud top temperatures that cold have the capability to produce heavy rainfall. At NASA's Goddard Space Flight Center in Greenbelt, Md. the NASA/NOAA GOES Project created an animation of NOAA's GOES East satellite imagery from Sept. 14 at 1:45 p.m. EDT (1745 UTC) to Sept. 18 ending at 7:45 a.m. EDT (1145 UTC). The animation shows Hurricane Jose moving north along the U.S. East coast, the development strengthening of Hurricane Maria and its approach to the Leeward Islands, and Tropical Depression Lee in the Eastern Atlantic. NHC noted the estimated central pressure inside the 10 nautical mile-wide eye has fallen to 959 millibars. The small eye is also apparent in radar data from Martinique. Near 14.7 degrees north latitude and 60.1 degrees west longitude. Maria was moving toward the west-northwest near 10 mph (17 kph), and this motion with some decrease in forward speed is expected through Tuesday night, Sept. 19. On the forecast track, the center of Maria will move across the Leeward Islands late today and tonight, over the extreme northeastern Caribbean Sea Tuesday and Tuesday night, and approach Puerto Rico and the Virgin Islands on Wednesday, Sept. 20. Reports from an Air Force Reserve Hurricane Hunter aircraft indicate that maximum sustained winds have increased to near 120 mph (195 kph) with higher gusts. Maria is a category 3 hurricane on the Saffir-Simpson Hurricane Wind Scale. Additional rapid strengthening is forecast during the next 48 hours, and Maria is expected to be a dangerous major hurricane as it moves through the Leeward Islands and the northeastern Caribbean Sea. Hurricane-force winds extend outward up to 15 miles (30 km) from the center and tropical-storm-force winds extend outward up to 125 miles (205 km). The minimum central pressure estimated from the Hurricane Hunter aircraft data is 959 millibars. NHC expects Maria's eye to move through the Leeward Islands during the afternoon or evening today, Sept. 18.